Peel and cut each banana if you use small or large bananas, cut each diagonally into six ½ inch (1 cm) thick, set aside. Combining the two types of flour and 1 ½ cup (325 ml) coconut milk and mix into a smooth paste abowl and smooth. Set aside. Blanch the banana leaves, pour boiling water over them in a container to be flexible. Drain and place the leaves on a clean work surface. To finish the cake, spread 2 tablespoons of the flour mixture through the center of a piece of banana on top and then spread to another 2 tablespoons of the flour mixture through the center of a piece of banana leaf. Place a slice of banana bread on top and then spread to another 2 tablespoons of the flour mixture over, covering the bananas. 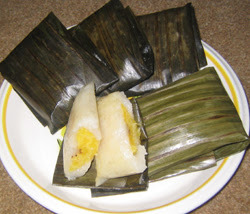 Wrap by folding one side of the banana leaf over the filling and then the other, forming a tight plot. Meta ends under and secure with a toothpick. Continue wrapping the remaining ingredients in this way. Steam from the plot in a wok on a rack in boiling water or a Stearns for about 20 minutes. Remove from heat and let cool before serving.